If it ain't broke, don't fix it! Kate stepped out in another creation from Erdem for the second night running during her royal tour of Sweden and Norway. 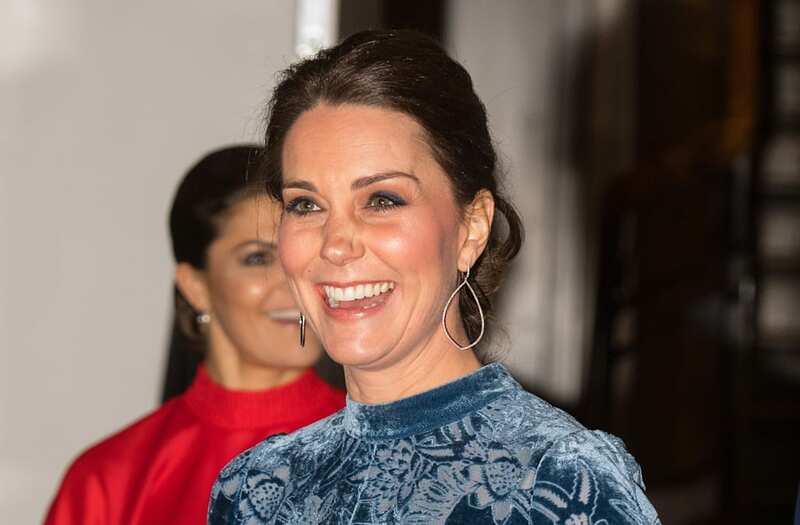 On Tuesday night, the pregnant royal donned a saffron yellow floral frock from the British-based designer for a reception at Stockholm's Fotografiska Gallery where Prince William is set to make a speech. This time around, she opted for a stunning blue velvet dress with a floral motif and dramatic bell sleeves. A simple ribbon around her waist accentuated her blossoming baby bump. The mother of Prince George and Princess Charlotte paired the look with a pair of black ankle strap heels, diamond earrings and her hair in a low chignon bun. She seemingly stole the spotlight from the beloved Crown Princess of Victoria, who wore a black satin pencil skirt and bright red blouse with statement sleeves. Earlier in the day, Kate looked gorgeous as ever in a cream Alexander McQueen tweed dress that she wore to tea at Haga Palace with Princess Victoria and her husband Prince Daniel. While greeting the crowds, she wore a red-and-white houndstooth Catherine Walker coat dress that bore a striking resemblance to a Moschino jacket worn by Princess Diana in 1990. After spending time in Stockholm, Kate and William will cap off their royal tour in Norway. Check out the video above for more on their trip.